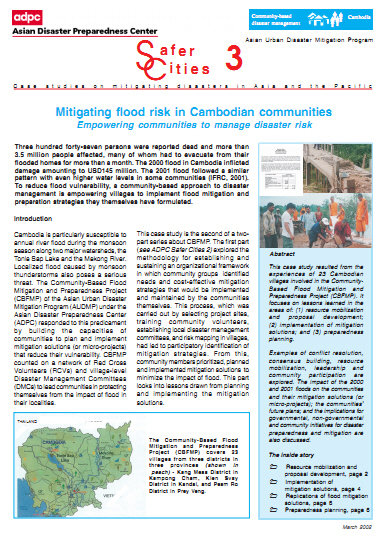 This case study resulted from the experiences of 23 Cambodian villages involved in the Community-Based Flood Mitigation and Preparedness Project (CBFMP). It focuses on lessons learned in the areas of: (1) resource mobilization and proposal development; (2) implementation of mitigation solutions; and (3) preparedness planning. Examples of conflict resolution, consensus building, resource mobilization, leadership and community participation are explored. The impact of the 2000 and 2001 floods on the communities and their mitigation solutions (or micro-projects); the communities’ future plans; and the implications for governmental, non-governmental and community initiatives for disaster preparedness and mitigation are also discussed.